﻿ Arc Elysees Hotel Paris. JIMAT di Agoda.com! Ada soalan mengenai Arc Elysees Hotel? Sama ada anda melancong atau ke luar kawasan kerana kerja, Arc Elysees Hotel merupakan pilihan penginapan hebat ketika melawat Paris. Hanya sejauh 40 km, hotel 3-bintang ini boleh diakses dengan mudah dari lapangan terbang. Dengan tarikan utama di bandar ini seperti Kedutaan Malta, Les Caves Taillevent, Kedutaan Burkina Faso berada pada jarak yang dekat, pengunjung hotel pasti akan menyukai lokasinya. Arc Elysees Hotel menawarkan perkhidmatan yang sempurna dan semua kemudahan penting untuk menceriakan pelancong. Hotel ini menawarkan pelbagai kemudahan di lokasi untuk memuaskan hati tetamu termasuk yang arif. Suasana Arc Elysees Hotel terpancar di dalam setiap bilik tetamu. televisyen skrin rata, internet wayarles, internet wayarles (percuma), bilik larangan merokok, penyaman udara hanyalah sebahagian daripada kemudahan yang boleh didapati di hotel tersebut. Di samping itu, pihak hotel menawarkan aktiviti rekreasi untuk memastikan anda mempunyai perkara untuk dilakukan sepanjang penginapan anda. Nikmati perkhidmatan yang sukar ditandingi dan lokasi benar-benar berprestij di Arc Elysees Hotel. Harap maklum hotel ini hanya menerima bayaran menggunakan kad kredit Visa dan Master Card. Good location, nice cosy room. The location is great, quite convenient. Staff were helpful. The size of room was spacious,being at the corner of the building. Considering the price, I'm happy with my stay here because its near champs élysée and the stop of the hop on and off bus. 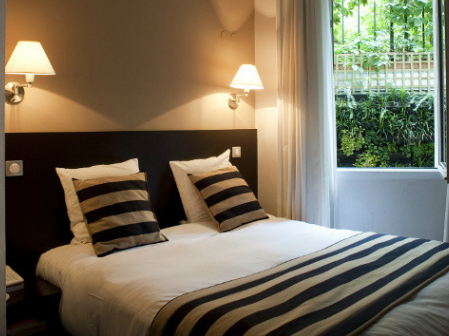 This hotel is located in a nice area, close to 2 Metro and a great shopping and dining area. The best thing that attracted me is the staffs, they are so lovely and always willing to help me with direction and all guiding. I stayed at this hotel at the 2nd time. The reason why I stayed here twice is as above... good location, not high-priced but location,room staffs are good. This time, I stayed at a single room, but twin room was better. Impressed by the hotel location, just a 15-min walk from the airport coach station or metro station. The reception staff was very helpful to our questions and made good recommendations to local tours. Although the room is clean and tidy, the room size is relatively small. It's very close to Arch of Triumph. When you arrive Paris by air, you can take aero bus of Elliot and you can walk to your hotel. It takes around 10 minutes to the main shopping street and metro station. BTW it's best to have a pot at room so that we could have hot tea at ourselves after long day run. The room is a bit tiny but it's Paris. very near to L'Avenue des Champs-Élysées and George V and Etoile station of metro. 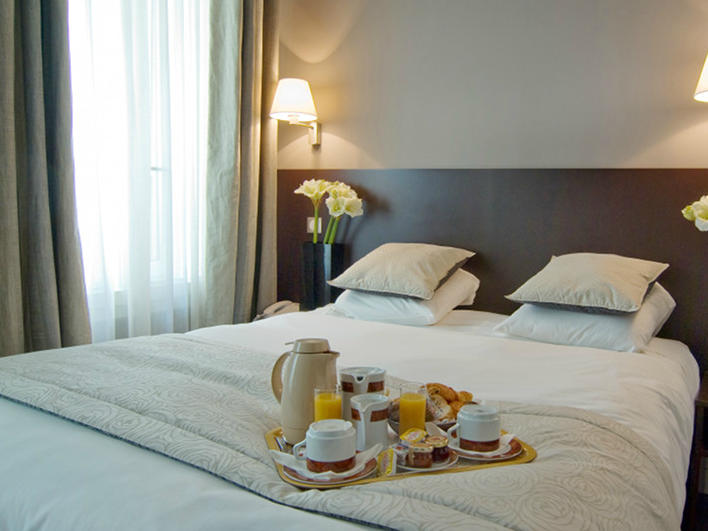 The hotel is located within walking distance from main shopping street. However it is not near to underground train station. Rooms are small and with limited facilities. Wifi Internet is provided free, but as good as non. Very slow and inconsistent connection. Give up after a while. There is a safety box in the room, but not usable. In one of the room, it is locked and no light, looks like runs out of battery. Another was without hander and instruction, can open either. 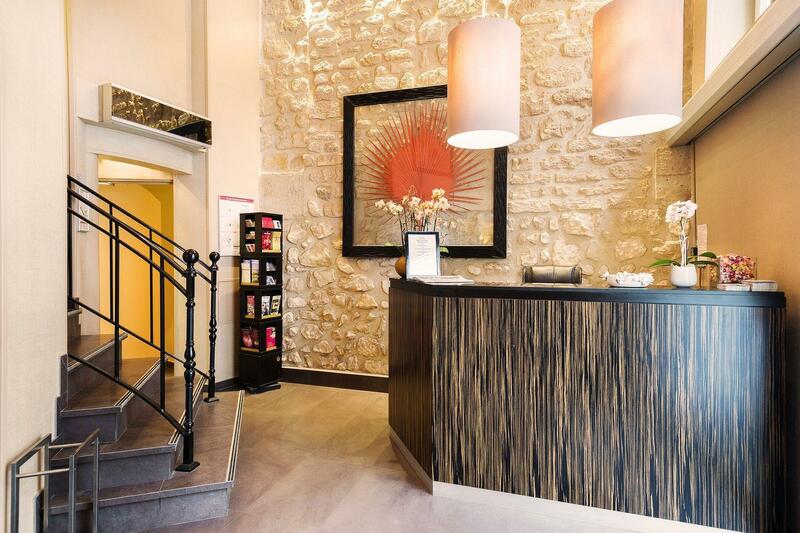 Hotel is located on a peaceful small avenue, about 200m from Champs Elysees and about 500m from the Triumphal Arc so the location couldn't really be betters. The rooms are really small but that's Paris. Interior is modern and fresh. Staff is really, really friendly and helpful. I can strongly recommend. location of this hotel is very good, and the rooms are relatively new. nice staff. 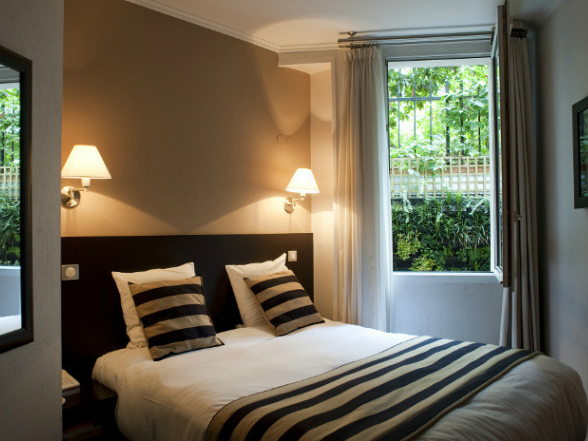 The hotel is stituated at a great location and just 10-15mins walk from George V metro station. The hotel staff are really friendly and warm. 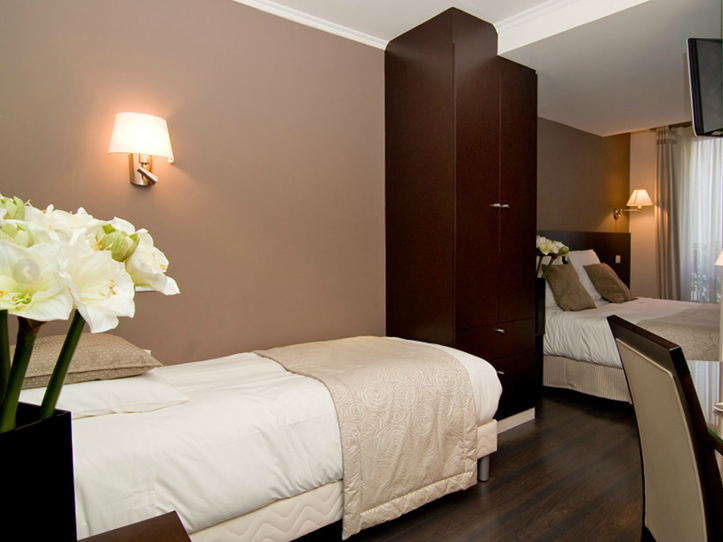 Very near to Arc De trimphe and just 5-10 mins walk away! Will revisit there again for my next trip to Paris! Room are pretty small but i guess most of the hotels are similar. Wish to have hot water provided in the room.